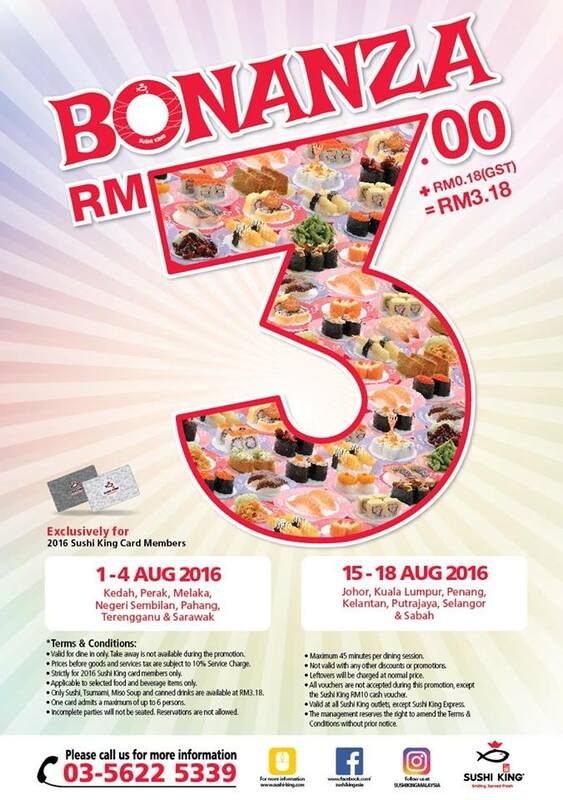 HomeFood & BeverageSushi King Bonanza RM3.18 Promotion Is Back! 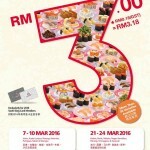 Sushi King Bonanza RM3.18 Promotion Is Back! 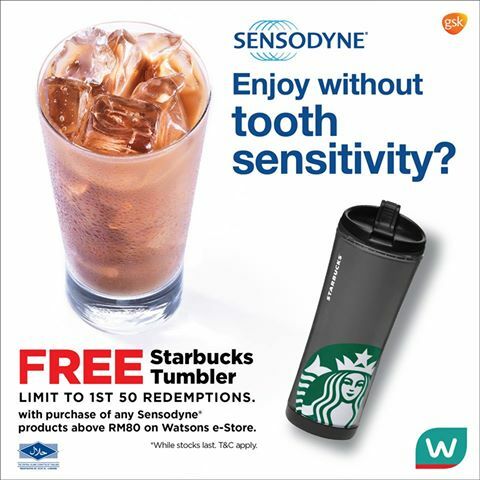 15 Aug – 18 Aug 2016 – Johor, Kuala Lumpur, Penang, Kelantan, Putrajaya, Selangor and Sabah. Incompleted parties will not be seated. Sushi King first opened our doors in 1995, pioneering a new era of Japanese cuisine in Malaysia with our unique ‘Kaiten Sushi’ or ‘Revolving Sushi’ with quick service restaurant concept. Offering a wide variety of sushi along with an expansive menu of other Japanese food at affordable prices in a friendly, cosy environment, we quickly gained popularity to become a favourite amongst locals and foreigners alike. 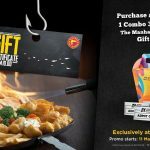 From a single outlet in Kuala Lumpur, we have grown to encompass over 90 (and counting) restaurants nationwide, distinguishing ourselves as the largest sushi chain of restaurants in the country. The novelty, affordability and efficiency of Sushi King restaurants proved to be our distinctive advantage; our specially equipped sushi-making machines and conveyor system showcasing quality sushi in a hygienic environment, as we offer quick and fresh food to suit today’s fast pace of life. The unique experience of selecting from a variety of sushi dishes on the revolving conveyor belt at leisure has attracted a wide variety of customers from all walks of life, from Japanese tourists and expatriates to even those initially unfamiliar with Japanese cuisine. 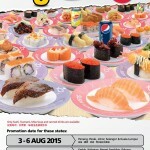 Sushi King Bonanza is Back Again! 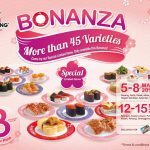 Sushi King Bonanza RM3.18 is back! 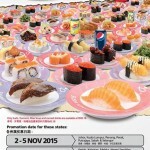 Sushi King Bonanza Promotion is back again! 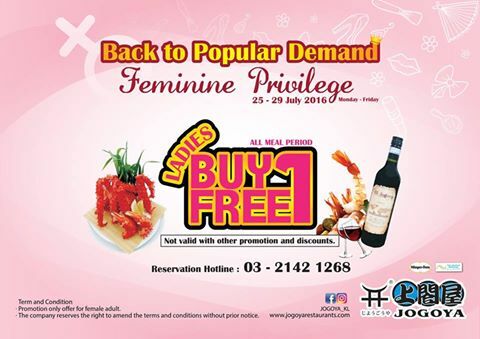 Jogoya Buffet Restaurant Feminine Privilege Buy 1 FREE 1 Promo!